I posted the post below back in 2007. Recently I heard from a soldier who read the post and contacted me. Read the post first and then read my e-mail dialogue with him. He ultimately sent me a picture of the grass he's growing over in the Middle East. 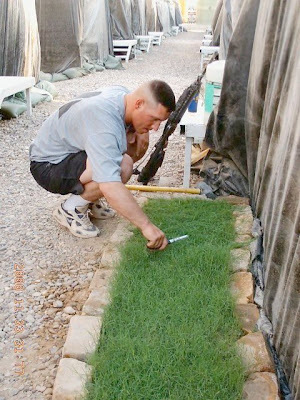 This Army soldier in Iraq has a tiny “plot”of grass in front of his tent. He’s stationed in a big sand box so he asked his wife to send him dirt ( U.S. soil), fertilizer,and some grass seed so that he can have the sweet aroma, and feel the grass grow beneath his feet. When the men of the squadron have a mission that they are going on, they take turns walking through the grass and the American soil — to bring them good luck. If you notice,he is even cutting the grass with a pair of a scissors. Sometimes we are in such a hurry that we don’t stop and think about the little things that we take for granted. I don’t know if this is true or not but I didn’t want to check out Snopes to find out. I want to think it’s true. I'm the author of the blog post about American servicemen growing a little plot of grass when they are in the Middle East fighting for our country. Are you over there? How are you. Thanks for contacting me! I'd love to be your pen pal for the durati on. My nephew spent 6 months in Iraq as a Marine a while back. He's home safe and sound. I had some KY blue grass sent over along with some other type from Pa (my home state).. We planted it and kept it well watered, well now we have grass growing, ill get you photos of it as soon as I can. There are a lot of people I'm in touch with in the blogosphere who would love to hear from our soldiers fighting for us over there. Happy 4th of July! I'm thinking of you and your safety all the time! Nah I dont mind if you post the photos and Emails. Im sure theres people still interested in some of the stuff soldiers are doing in their spare time. So If you have any questi ons, feel free to ask. Heres a photo of some grass that we have growing. We have 100's of the barriers protecting our buildings, so we got the great idea of makeing them more "homie". I thought you might find this interesting. Keep Bradley Bell in your thoughts when you can. And if you pray, I'm sure he'll appreciate prayers to keep him safe. you have such depths of love in your heart! that soldier is so fortunate to have found you and so are we! because of your sharing this with us, there will be many more prayers going up for mr. bradley bell! I have lots of family members who have served many, many years in the military; their time has included service in Kuwait, Iraq, and Afghanistan. I know these soldiers and Marines use all sorts of coping mechanisms to get through their deployments. Thanks for reminding your readers that the service people just want to do their duty and make it home safely. That is so cool. God bless you and God bless the men risking their lives over there. This is so beautiful, Mary. I had seen this picture before but had no idea that you were in contact with the serviceman. Thank you for this. Just beautiful and so touching! Wow! Those soldiers seem to be having more luck growing a patch of grass in the desert than i am in my back yard. Wonderful to read your post and Bradley's emails. Good to know the chain of hope is growing! That was wonderful Mary! Please tell your soldier that we are thinking of him and praying for his safety every day. It will be over soon and they will all come home. How utterly bizarre and yet completely understandable at the same time. Add me to the list. My kind of guys and gals. It is a conversation that makes me pause - look around - think - pray until I get myself together again - before I go again with my life- my life is easy and beautiful - thanks to Bradley Bell who is growing seeds of hope far away from me. Damn Mary it is 930 pm her close to my bed time and I am crying getting a stuffy nose, because of your post!That is a sweet thing you and I am pretty sure he will remember you for a long time. He has my gratitude.